Should we have a “95:5 rule” for ICTs and development? Typical consumption-related uses of ICTs touch 95% of people but make only a 5% difference to their livelihoods. This covers “intensive” application of ICTs: their use to intensify an existing livelihood. Examples include use of mobiles to bring market information to farmers; access to e-government at a local kiosk, substituting a journey to district headquarters; use of a website helping handicraft producers sell their goods; or use of email by a retailer in a low-income community. Typical production-related uses of ICTs touch 5% of people but make a 95% difference to their livelihood. This covers “extensive” application of ICTs: their use to extend the range of possible livelihoods, by created a new ICT-based livelihood. Examples include the umbrella people selling mobile phone calls by the street; or a worker from a poor community undertaking data entry work; or a mobile money service agent. So extensive ICT livelihoods only exist because of ICT and they fall into the ICT sector, broadly defined. A classic example is the comparison of two studies from Kerala, India. The arrival of mobile phones in one fishing area led to an average 9% increase in profits for fishermen. Given 75% of income in South Indian fishing households comes from fishing, that suggests ICT consumption increased household income by 7% on average. Simultaneous to this, the Keralan government was engaged in setting up an IT impact sourcing initiative, outsourcing data entry and digitisation work to groups of women from below-poverty-line families. These new ICT jobs led to an average 75% increase in household income. As with most quantitative findings, these specific figures don’t exactly match 5% or 95% but an overall average may get closer. Let’s first take evidence on intensive use. Consumption-related evidence sometimes reports more than a 5% income increase. But this must be set against other work that shows a less than 5% income increase or no increase or questions the limited time-scales or scope of studies that demonstrate income increases. And it must also be set against the occasional study showing an exact match: “Internet users reported an increase of US$ 51.86 in labor income … 5.01% per year”. Can we say that 95% of those living in the global South are digital ICT consumers? We are certainly close to that point. There were just over 90 mobile subscriptions per 100 citizens in developing countries in 2014. We need to bump that down to take account of individuals with multiple subscriptions but bump it up again to take account of shared access. The end result will be in the neighbourhood of 95%. Turning to evidence on extensive use, many of those working in the ICT sector derive 100% of their income from their employment. We could shade that down overall given some with ICT-based livelihoods will have other income sources. The proportion of those working in the ICT sector is growing but typically less than 5% (e.g. 5.7% of employment in OECD countries but generally much lower in less-wealthy countries). 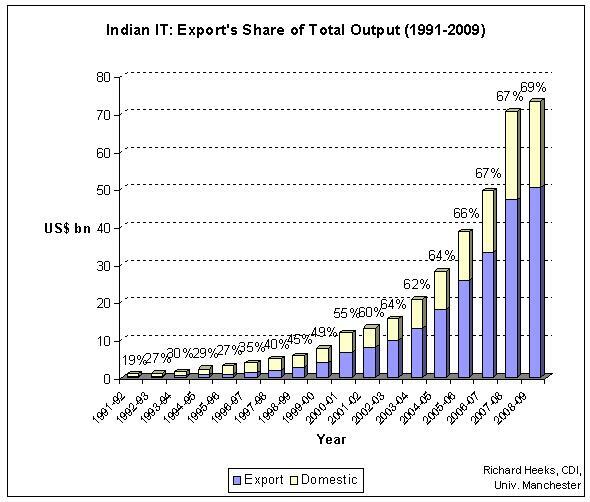 As an example, India’s ICT sector represents less than 1% of India’s workforce but that must be multiplied by three given the estimate that two-thirds of India’s ICT jobs lie outside the formal ICT sector. 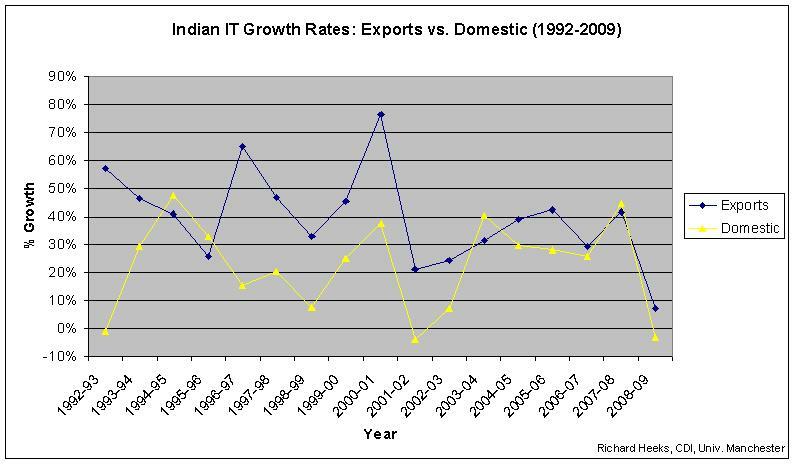 But that estimate may exclude a number of ICT-based livelihoods, so the result may at least be heading for 5%. It is certainly increasing year-on-year. Given these pulls in various different directions, an endpoint of 95%:5% is not unreasonable, and certainly all the evidence points to some form of strong Pareto-type distribution. 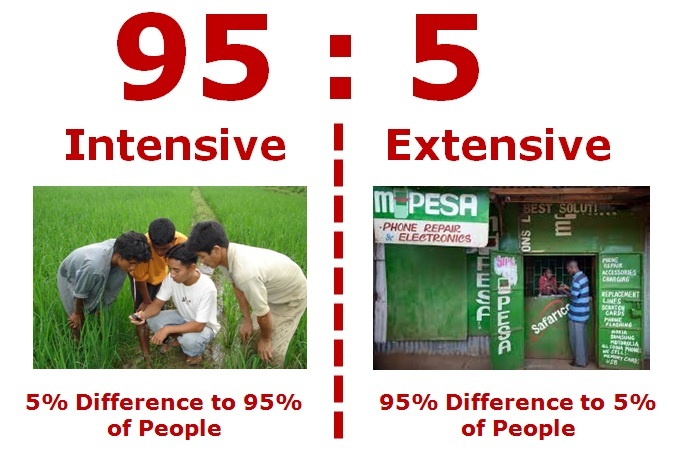 Mathematically, 5% of 95% has the same development effect as 95% of 5%. That means these two uses of ICTs should be given equal emphasis by governments, development agencies, development informatics researchers, ICT4D practitioners, etc. But at present they are not. Intensive, consumption-related ICT application is given far, far more attention. In future that needs to be rectified, with equal emphasis given to digital inclusion by improving existing livelihoods; and to digital inclusion by creating new ICT-based livelihoods. NSSO (2013) Key Indicators of Employment and Unemployment in India, 2011-2012, National Sample Survey Office, Government of India, New Delhi; Nasscom (2014) India IT-BPM Overview, Nasscom, New Delhi. This entry reports findings from a survey of nearly 400 mobile phone users in The Gambia conducted by Fatim Badjie, who recently participated in Manchester’s MSc in ICTs for Development. Ownership and Costs: 83% of phone users owned their mobile; roughly 70% said that it was cheap to use a mobile. Mobile Usage: 82% said the most-used facility on their phone was calls; 12% said it was texting; 3% said it was Internet browsing. Overall, 38% said the service they enjoyed most was texting; 15% said Internet browsing; 8% said conference calls; 5% said video calls. 47% share their mobile with other people, sharing with an average of 3.1 other people. That means, overall, the average mobile is used by 2.5 people (i.e. shared with 1.5 other people). On average, users said they used their mobiles 28 times per day, and two-thirds use their mobile at least 10 times per day. Availability and Issues: roughly 60% of users said they always had a signal and that services were available even in “inconvenient” locations (though of course Gambia is a small country). Only 30% reported the mobile was always effective for communication and roughly one third reported they felt mobile use had become a burden to them – mostly financially but also socially or personally. For the 55% of users who wanted improvements, these almost all related to getting 100% network coverage in the country, or wanting cheaper prices. Impacts and Benefits: 78% felt they benefited from having a mobile particularly due to low cost of calls. 31% felt having a mobile helped them to make or get money, for example through calls from customers to go and collect money owing or, more often, calling family/friends for money (“money calls”). 58% thus felt they had come to depend on their mobile, and 78% said they could not see themselves living without one. – No real difference in rates of ownership, rates and scope of phone sharing, difficulties experienced, or dependency on mobiles. – Slight tendency for women to have been using fixed lines rather than telecentres as a prior means of communication. – Women use mobiles a little more than men on average per day (28.6 vs. 26.6 times). – Less use of mobiles for Internet browsing by women than men; more use of phones for texting. – More men (38%) than women (24%) said the mobile helped them get money and resources, though women used phones proportionately more for “money calls” than men. My commentary would be that, overall, this is a reminder of how mature the mobile market is getting in Africa with very high rates of ownership, very high rates of usage, and signs of movement beyond basic calls/SMS: at least 15% going online via their mobiles, at least 13% using video/conference calls. With roughly one-third saying they use mobiles to make or get money, it looks like quite a valuable financial tool: so embedded that nearly fourth-fifths of users couldn’t imagine life without it, including some who see mobiles as a “necessary burden”. ITU estimates for 2009 (the year prior to the survey) there were 84 mobile subscriptions per 100 population in The Gambia. Even allowing for calculations to convert from subscription data to actual ownership and use (see earlier blog entry), this means phone users were by far the bulk of the Gambian population during this survey (so skews compared to the overall population will be present but probably limited). Given the rates of sharing reported it means that access to a mobile is virtually universal (though it must also mean that many people share their phone with others who already have one). Noting exclusion from the survey of women (and men) who don’t use mobiles, there was relatively little difference in ownership and usage patterns between men and women. Is that, too, a sign of market maturity? Finally, a reminder that, even in a small country there can be significant locational differences and that “market maturity” has a rural—urban axis. Users were surveyed in seven different parts of The Gambia but the table below compares some of the key findings for those surveyed in the capital, Banjul, and those surveyed in Bansang, a small town three-quarters of the way up-country. The data show some not unexpected differences. In the rural location, there was much less ownership of mobiles and much more sharing; much less use of non-call services and generally much less daily use of the mobile. Network availability is more of an issue in the rural area, but the mobile seems to be more useful for getting money and far fewer users in the rural area can imagine life without it. You can access the results of the survey by clicking here: they also include more Gambia-specific questions about operators, services, and awareness of institutions. Note the breakdown-by-location is very lengthy, and not provided in this document. How are ICT diffusion rates changing over time in different parts of the world? 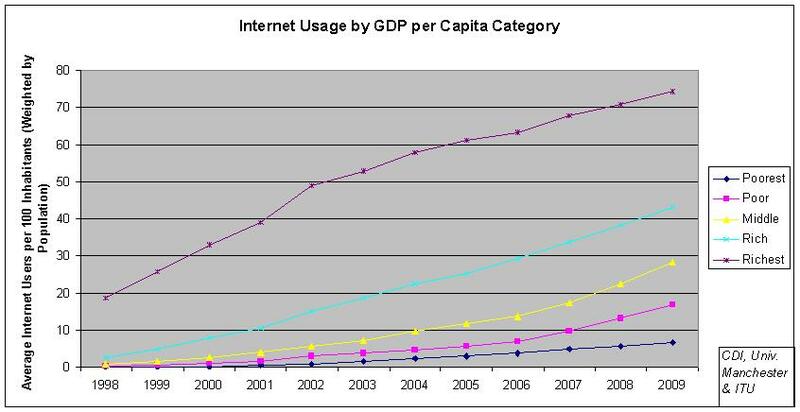 The graphs below present ITU statistics for mobile, internet and broadband, dividing countries into quintiles by GDP per capita levels, and weighting the calculated averages within each quintile by population. They extend earlier data visualisations using Google motion chart for mobile phone and broadband penetration. – Internet: still a significant gap between the richest countries and all the rest, which have a mix of larger-country stars (VietNam, China) that punch above their category averages, and dogs (South Africa, India) that fall well below. 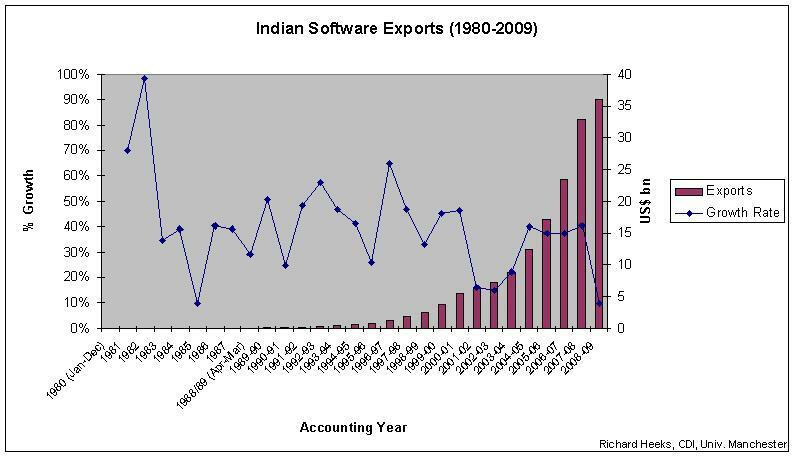 Due to spillover effects – e.g. an Internet user passing on web-based information to a non-user – the impact of the Internet is well above what these raw figures indicate. And poor/middle-income countries will pass the 50 users per 100 marker in just a few years. Growth rates in the poorest countries are strong – around 25% per year – but their low base means progress is slow. One way to summarise the situation is to look at the difference between the poorest and richest quintile countries. 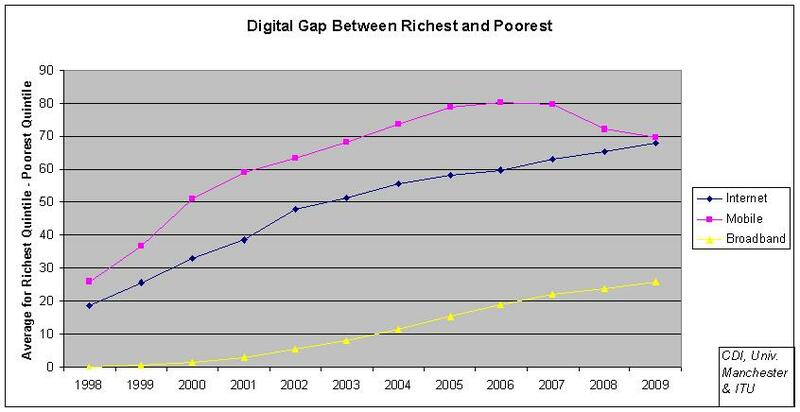 As the graph shows, the “digital gap” between average penetration rates has grown and grown during the 2000s for Internet and broadband. 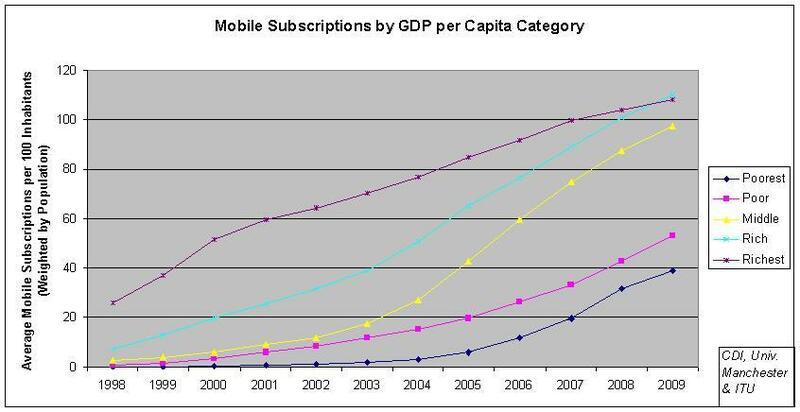 For mobile it began to close from 2006 onwards, but still remains very high. You can also measure “digital lag“: the time gap between a given average ICT penetration level in the poorest countries, and the year that was achieved in the richest countries. Current digital lag is just under 10 years for mobile, and something like 14-15 years for Internet. 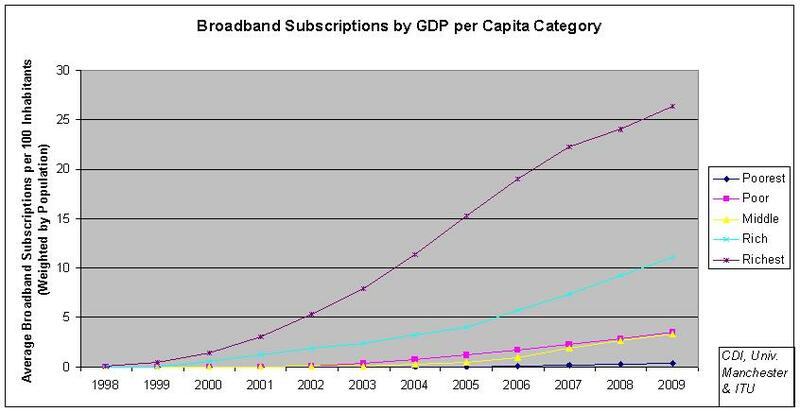 For broadband, it’s just over 10 years but the figures are so low that this may not be meaningful. 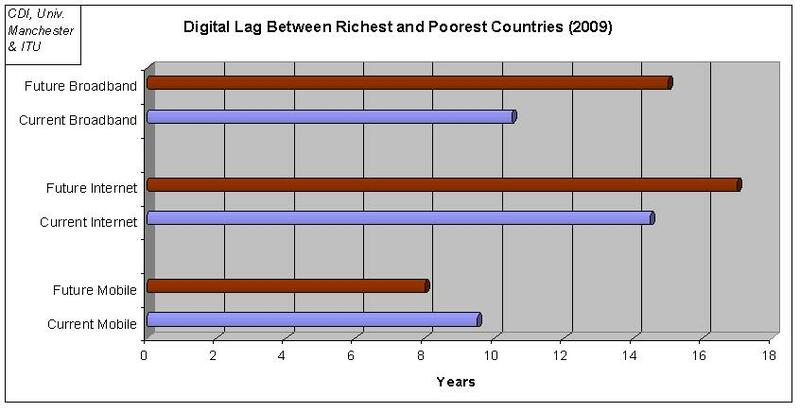 Future digital lag can be calculated by projecting growth in the poorest countries, assuming current growth rates (averaged 2004-2009) continue. For mobile, it will be 2011 before the poorest countries reach the 75 subscriptions per 100 level that the richest countries were at in 2004; a digital lag of 7 years (though that rises to 2013 and 9 years if you extrapolate from just 2008-to-2009 growth rates). For Internet, it will be 2019 before the poorest countries reach the 50 users per 100 level that the richest countries were at in 2002; a digital lag of 17 years. For broadband, it will be 2020 before the poorest countries reach the 15 users per 100 level that the richest countries were at in 2005; a digital lag of 15 years (but with a wide margin for error, and calculated only on 2008-to-2009 growth rates). Put another way, there are no signs yet of the digital lag for Internet or broadband closing over time, and not much evidence for the idea that digital lag is shortening with each new ICT innovation. A previous blog entry on publication of ICT4D research through academic outlets suggested that the field was growing fast. In this entry, I look at ICT4D on the web and in the news, and draw some slightly more downbeat conclusions. These must be taken with a strong pinch of salt because the data looks somewhat cronky. But what can Google Analytics tell us about ICT4D? 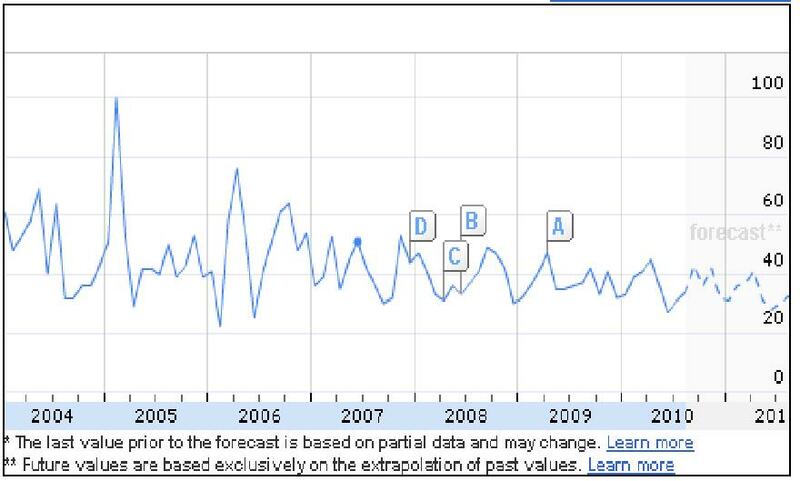 This suggests a peak of interest in ICT4D as a search term in 2006, and a small but steady decline thereafter. A conclusion only slightly undermined by the fact that it records 100% of searches coming from the US; and the fact that the graph was a somewhat (though not greatly) different shape when I looked at it yesterday. In any case, Google Insights data is just relative to the recorded peak of “100”. For a guide to absolute search levels, Google Adwords suggests a global average of 5,400 searches per month using “ict4d” during mid-2009 to mid-2010 (for all countries, in English). (For comparison, “ictd” scores 2,900 (though a bit messed-up because ictd can mean things like “implantable cardiac therapy device”), and “development informatics” scores 1,300.) And just in case you want to feel bad about ICT4D as your chosen field, “e-government” scores 200,000 monthly searches even though it is, like, sooo 20th century as a concept. (A joke, by the way, just in case you were considering buying my e-Gov textbook!) I did the same search some months back: the monthly average for 2009 alone was about half the figures shown here suggesting an increase in ICT4D search activity in 2010. Looking at the individual news items recorded, there is some evidence of a WSIS effect creating mini-peaks in 2003 and 2005. In general, the level of news items seems to have been fairly steady since 2006/2007 – it remains to be seen if the extrapolations for 2010 (showing a significant increase in interest) are borne out. – The base of data that Google Analytics provides is too small and uncertain to draw any strong conclusions. – Since its first appearance around 2003 “ict4d” has been very useful for those in the field, but it has not really made it into the mainstream: something worth bearing in mind when trying to write for a mainstream audience. News stories and searches more often use broader terms (as another exemplar, of the top 40 search terms used to find items on this blog, only 6 contain the term “ict4d”). 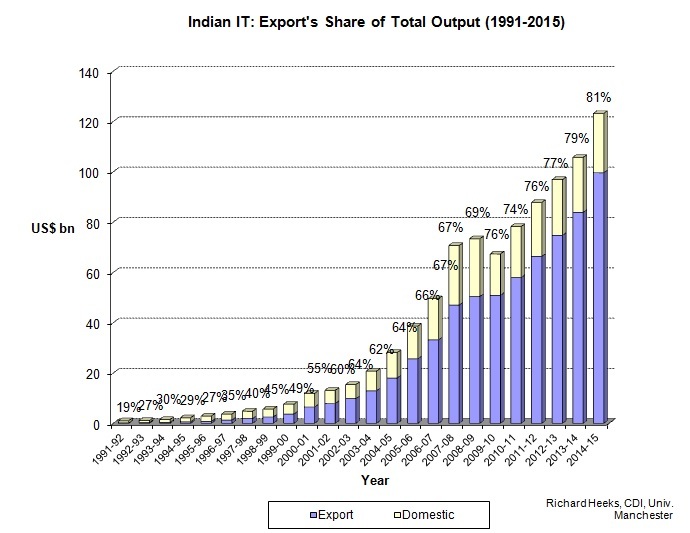 – The rapid recent rise in academic publication on ICT4D is not mirrored here. There are some signs of a small peak of interest in the mid-2000s, but that might be exceeded in 2010, and the broader picture is one of fairly steady interest in ICT4D as a news and web search item during the latter half of the 2000s. But maybe someone with better knowledge of Google stats will proffer some other conclusions . . .